Constructed in 2001, the Mega Express Three ferry can carry up to 2100 passengers and 650 vehicles. 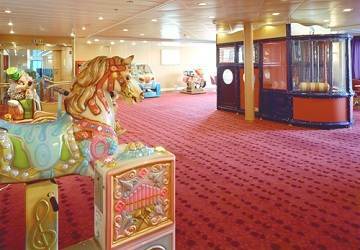 The ship has all the amenities you’d expect of a ferry of this stature including a large selection of cabin accommodation, reclinable seats, shops, a la carte and self-service restaurants, 3 bars, a swimming pool, solarium, games room and children’s play area. Mega Express III has around 370 en-suite cabins (approximately 1425 beds) and a reserved seating lounge with reclining seats to accommodate up to 430 passengers. Please Note: Whilst we have taken great care in making our Mega Express Three guide as accurate as possible, onboard facilities, services and entertainment may vary depending on the date and time of year that you travel, facilities mentioned may change without notification and ferry companies reserve the right to operate vessels other than those mentioned at time of booking without prior notification. Good trip, the crossing went really well, clean ship, punctual, nice and helpful crew. Not really pleasant the landing procedure where people are in rush to leave and from the back of the ship they turn on the motor of the car intoxicating everyone. And in the reserved seats area is always full of people without reservation, they take seat and make noise, day and night. All the rest ok, others companies are worse. In the last few years we spent the holidays in Sardinia, and we travelled with different operators in different ports. Congratulations for punctuality, cleaning, hospitality and order. "Crossing to Golfo Aranci and back, July 2015"
very good and well organised company. Return crossing with a cabin was perfect. "First experience with Corsica Sardinia express"
Time on board went really fast, it was during the day, so I walked, had a coffee, had lunch, dinner. 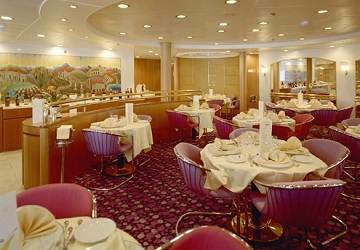 Punctual and beautiful ship, nice and helpful staff. POSITIVE experience. PS. People laying on stairs or in the corridors are really rude, there is no need to do that when there are free space where to seat on board. 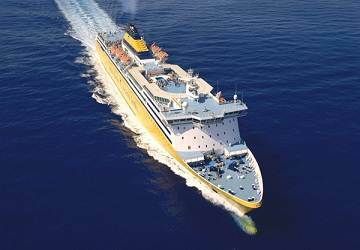 "Excellent ferry service to Sardinia"
This ferry is of a very high standard. It is comfortable, bright, airy, with a choice of different restaurants. There is a kids play area and if you want to relax there is an area where you can pay for reclining seats in a spacious and comfortable area. Best to prepay for these especially at busy periods. It is well worth the 11 euros to have a comfortable seat and somewhere you can sleep if you want to on the 6 hour journey. You can buy them at the reception on board if there are any still available. There are also cabins available, although we didn't try these, but they looked very good too. "Travel with Mega Express Three + Corsica Marina"
All good especially with Mega Express Three. Unfortunately we did not book the cabin with Corsica Marina and the night was really long. great trip, comfortable cabin but they should offer more seats on the deck to enjoy the sun. I booked with 15 days in advance and I had a good price. 2 hours late outbound and return with sardinia ferries.